Climate finance is always considered a deal maker or deal breaker at the international climate change conferences of the UNFCCC. This is particularly true this year with COP24 in Katowice that has just started. Civil society organizations are therefore demanding clear progress on climate finance. Among the key issues are ensuring that the $100 bio promise is kept, agreeing on a new target, on defining the rules for accounting climate finance as well as anchoring the Adaptation Fund under the Paris Agreement. This article provides an overview of some of the key demands from different civil society organizations who are part of the website www.germanclimatefinance.de. In the absence of an agreed definition of climate finance, countries continue to disagree on what can be counted under reporting on finance. While it is in the interest of developed countries to widen the categories to include, for example, non-financial efforts such as capacity building measures and technology transfer, or finance provided as commercial loans, developing countries want to keep the focus on reporting of new and additional financial resources provided on top of official development assistance. In a similar way, there is a disagreement whether to count grant equivalent of loans or the face value of loans, whether to count non-concessional loans, guarantees, equity and whether the reporting of the climate-specific component on a project-by-project basis should become a general standard. For a robust reporting mechanism, all countries should provide similar types of information for every channel and sources of climate finance. This way they can ensure comparability and coherence when informing on the mobilization of climate finance. While it is important to recognize national circumstances and availability of information (such as specificities of national budgets) and allow for a flexible process where countries can also provide some qualitative information where it is not possible to quantify the contribution , it is vital to agree on common format and timeline, thus allowing for a synthesis report on projected climate finance. While the 2020 deadline approaches for the USD 100 bn per year goal to be provided by developed countries for climate action in developing countries, recent analyses shows that governments lag behind in clearly demonstrating a credible plan on how to achieve that goal. Further analyses by CARE, Oxfam or our own analysis show that in most donor countries’ support to developing countries the share of adaptation is still far below 50%, and that there is an overall need to scale up public climate finance. The Adaptation Fund has been playing an unique role in the international climate finance architecture and has supported concrete adaptation projects in developing countries since 2010. In the decisions accompanying the adoption of the Paris Agreement, it was agreed that the Fund “may” serve the Agreement. A year later, at COP22 in Morocco, Parties went a step further by deciding the Fund “should” serve the Paris Agreement. However, this needs to be finalized in 2018 with a final decision at COP24 which should also specify the Fund’s operating modalities, institutional arrangements, and safeguards. While enshrined as an article in the Paris Agreement, loss and damage is not formally part of the Paris Agreement Work Programme (PAWC). At Bangkok, however, the issue made a surprisingly strong appearance. One group of developing countries urged that the PAWP must include the need to identify information on loss and damage in the rules of the enhanced transparency framework. Expect developing countries, especially the small island developing states, to also push for commitments to address loss and damage in finance item of the Paris Rulebook. Enough finance to reach USD 100 billion by 2020: Developed countries should provide concrete plans for how to live up to the collective commitment to provide US$100bn in new & additional climate finance per year by 2020. This should be balanced between adaptation and mitigation, with at least 50% of finance for adaptation, and should include indications for a strong replenishment of the GCF in 2019 significantly higher than previous pledges. The high-level ministerial on climate finance during the COP is an important opportunity to announce such plans. More gender responsive finance: Parties should increase efforts to promote gender equality through their bilateral climate finance as well as in multilateral mechanisms, so that by 2020 at least 20% of climate finance supports projects which pursue gender equality as a principal objective (OECD marker 2) and at least 80% as a significant objective (OECD marker 1). More appropriate accounting and reporting: On reporting past climate finance (Article 9.7 negotiations), Parties should agree to only count grant equivalent of loans; not to count non-concessional loans, guarantees, equity – as public finance or as mobilized private finance; to report the climate-specific component on a project-by-project basis, with separate reporting of loss & damage finance; and to exclude fossil fuel projects. Better predictability: Parties should also agree on mandatory reporting of projected climate finance (Article 9.5 and APA 8a negotiations) with a common format and timeline, allowing for a synthesis report to be produced and discussions to be held at a biennial finance ministerial. New finance goal: Parties should adopt a structured, inclusive, and balanced process to set the post-2025 finance goal (APA 8b negotiations). Germany has some important domestic tasks ahead of itself, in particular the increase in ambition on its climate goals and the exit from coal-On climate finance, Germany has promised a doubling of its public climate finance until 2020. This needs to be backed up by sufficient budget allocations where Germany still needs to increase its efforts and the doubling pledge should also be applied to German funding pledges to the Green Climate Fund (GCF). 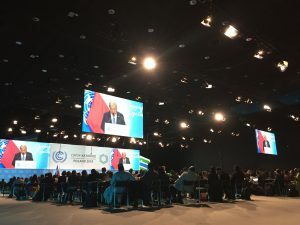 Germany can support progress on the replenishment of the Green Climate Fund (GCF) and on securing the financial stability of the Adaptation Fund by using the opportunity of the COP to announce additional pledges, possibly together with other donor countries. In addition, Germany as one of the biggest providers of climate finance and a progressive actor in the COP should support the discussion on climate finance by supporting the agreement of clear and robust accounting and reporting mechanisms. Here Germany can build on the transparency standards it already applies i.e. with regard to project based reporting, while taking home important lessons where it can still improve, e.g. on applying stricter on the accounting of adaptation finance.